The Madison Counter Stool strikes a unique balance between modern and countryside styling. The lines are simple and clean, and the design is straightforward and offers the comfort features that make long-term seating a pleasure. 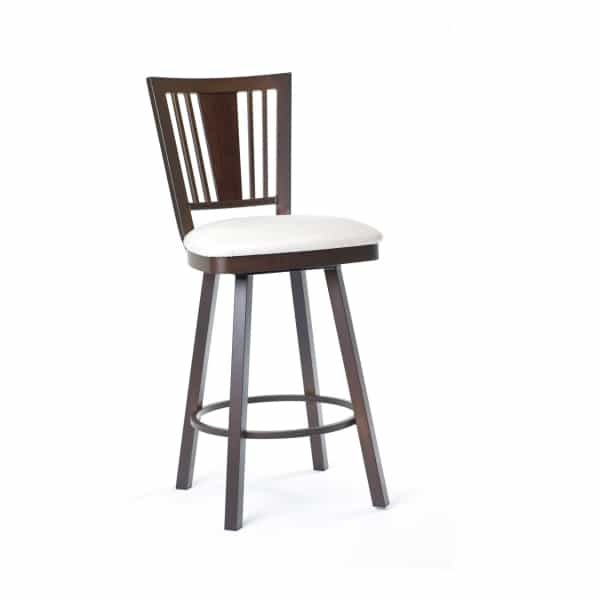 The Madison Counter Stool features a tall seatback, which is a necessary comfort feature for many. The Madison lacks armrests in order to save space, but the 360-degree footrest lends added support. The seat sits on a 360-degree swivel and is equipped with a plush, covered cushion. The seatback is wooden, but the rest of the frame is stainless steel. That doesn’t mean it will appear metallic. Rather, you may choose from the large selection of frame finishes to decide between a wooden lookalike, as featured on this page, or go an urban, metallic route. You may also choose the cushion cover from a large selection of fabrics that include solid colors, earthy hues, and funky patterns. Let your inventive Madison Counter Stool brighten your counter space!